Rapidly deployable, public facing branded web portals, linking seamlessly with existing back office business applications – so that Added Dimension can help their clients win real business every day, day in and day out. With millions of pounds of the world's latest IT equipment under their control, Added Dimension is a European leader in the provision of Loan & Demo management services for major technology manufacturers. 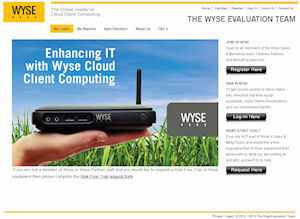 Their client list includes organisations such as Dell, Hewlett-Packard, Lexmark, Samsung and others. The process of getting correctly configured equipment to the right people at the right time as part of a high value presales evaluation process is complex. Seamless liaison is needed with the manufacturer's sales and technical teams, independent sales channel staff and the ultimate potential customer to make sure the evaluation runs smoothly. Once over, the equipment also has to be collected and checked so that the whole process can be repeated for more potential clients. 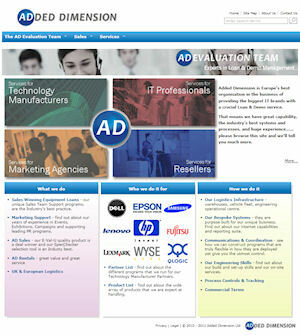 The ultimate goal throughout is to help the technology manufacturers - Added Dimension's clients - win more business. Offer Market Leading Client Branded Web Portals – Without breaking the bank! To enhance their market leading position, Added Dimension wanted to improve the flexibility of their public facing web based systems, provide more in-house control over their content and maintain tight, real time links with their core back office operational systems. At the time, Added Dimension's Flash based corporate web site could only be updated by the original suppliers and was proving costly to maintain. Their legacy web application, having served them well, was beginning to show its age and was unable to provide the variation in facilities needed to support their growing client base. Following a detailed review of potential content management systems to act as a foundation for their solution, Aspen Software's recommendation to use the mojoPortal CMS coupled with a suite of custom developed features was adopted. mojoPortal allows Added Dimension to deploy new web portals rapidly. These portals are customised with their clients' branding to act as the external focal point for their Loan & Demo management programs. Custom features, developed by Aspen Software, allow Added Dimension's in house team to place content on a site that interacts seamlessly with their back office systems. While mojoPortal's standard features make it very easy to add a whole range of general purpose content to a site, the custom features extend this so that pages can be created to support the intricacies of the Loan & Demo process with real time updates and retrievals from Added Dimension's core operational systems. Allow client sales and technical staff to set up and manage all details for a loan, including real-time equipment availability searches, business justification and stakeholder communication. Let client management authorise the business arrangement for the equipment loan. Enable the ultimate recipient to verify and confirm arrangements for the equipment loan. The role based access controls provided by mojoPortal, coupled with additional background integration with Added Dimension’s operational systems ensures security of access to the sites and data. This also links with the back office CRM facilities to simplify the management of several thousand users across a growing number of portal sites. 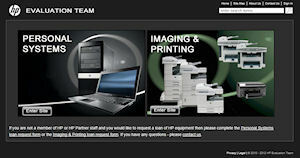 As part of the project implementation package, Aspen Software also provided a redesigned corporate site (added-dimension.co.uk) built using mojoPortal so that the Added Dimension in house team could familiarise themselves with the CMS and develop a common set of skills for all their web management. In addition to the custom control development, the project also included the provision of “seed” portal sites and “seed” skins to allow the Added Dimension team to build and deploy new portal sites without external support. The nature of the development means that, as new releases of mojoPortal are made available, their existing portal sites can be upgraded easily to take advantage of new facilities within mojoPortal while retaining the functionality of the custom features. This approach has helped Added Dimension achieve the results they needed from their web applications in a very cost effective manner. They can provide a highly responsive and tailored solution to delight their clients, win new business and give them a distinct competitive edge. To find out whether a custom solution can help your business, please contact us for a friendly, no-obligation telephone consultation.